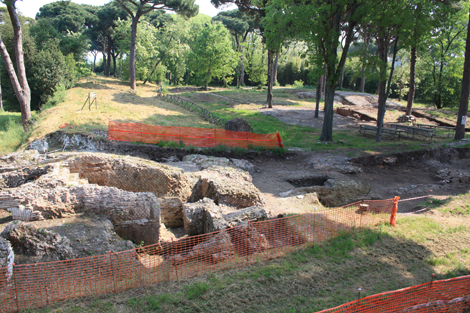 A large late Trajanic-early Hadrianic structure (c. 180 m by 60 m) lies to the southeast of the Palazzo Imperiale. The building is composed of brick-faced concrete piers with a series of brick arches extending north-south along the piers forming parallel bays which stretched from the Claudian to the Trajanic basins. 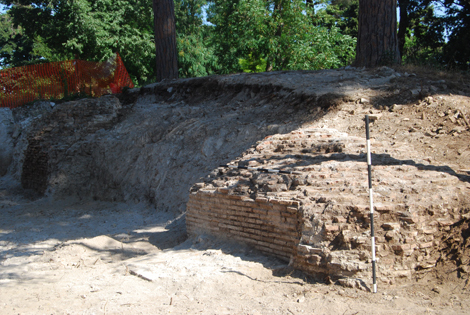 The arched openings were subsequently filled in with brick- and reticulate-faced walls. The width of the majority of the bays is c. 12 m. The building’s original function is uncertain, but it was probably commissioned for the construction and maintenance of ships, as the structure’s form closely resembles that of later historical ship buildings. 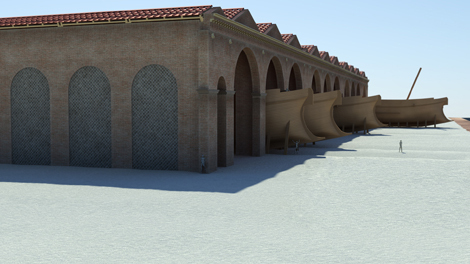 At some point in the early 3rd century, at least one of the large bays was converted into numerous rooms with suspensurae, potentially indicative of grain storage.